A web of issues has kept me from writing in the past few weeks, and the entire experience has had me think deeply about how seemingly intractable concerns self-perpetuate. I’ve also been dealing with intractable, difficult-to-treat neuropathic pain that results from damaged nerve cells. Typically, pain is associated with signals sent along specialized nerve fibers—nociceptors—whenever you experience something like a stubbed toe. In the case of neuropathic pain, however, it can be the very nerve fibers that communicate pain to our central nervous system that are themselves damaged. 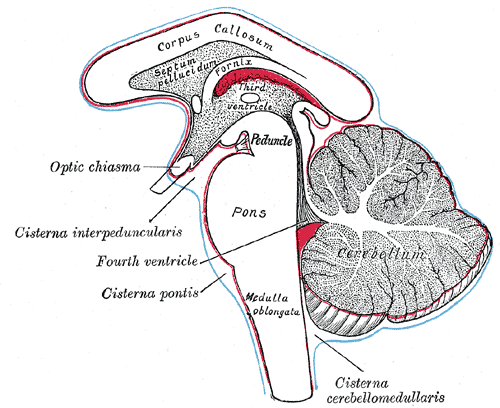 The pain signaling process that typically alerts us to harmful stimuli is suddenly miscommunicating, with nociceptors firing in the presence of usually non-painful stimuli (allodynia) or firing spontaneously or at higher intensity (hyperalgesia). In my case, the damage wrought by successive MS-related relapses last fall created multiple lesions in my brain and spinal cord, with many localized in the midbrain (the part of the brain that controls autonomic nervous activity, such as breathing, temperature regulation, and motor coordination). My last MRI indicated at least twenty different lesions—area of the brain where demyelination led to disruption in nerve signaling, possibly even the destruction of entire neurons. My symptoms include abnormal sensations (dysesthesias), like throbbing or “electric shocks” in my hands or lower back. However, the issue that’s been disrupting my life the most has been the never-ending throbbing at the back of my head—precisely in the midbrain region, where the cervical spinal cord meets with the brain. That my case is emblematic of the strange symptoms MS can cause is clear: this is nothing like a migraine or typical pain that I’ve experienced before in my life. In my case, it isn’t exactly an “acute” pain sensation either—it’s more like a dull, but heavy, throbbing that refuses to go away. Over-the-counters (like Advil, Motrin, and Aleve) have no effect. Typically, the treatment regimen for neuropathic pain includes anti-seizure medications (like gabapentin and pregabalin) or tricyclic antidepressants (like amitriptyline and nortriptyline)—both of which I’ve already tried. 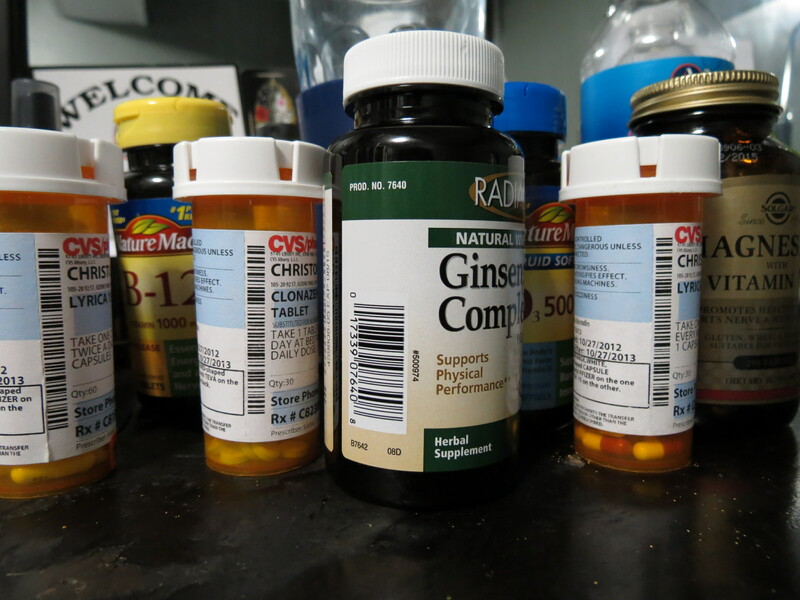 The downside with these medications is that they exacerbate a symptom I was already having before the demyelination period I had last year—chronic fatigue. Having learned more about the pharmaceutical industry, the history of the medical establishment in the United States, and the medical-industrial complex (MIC) overall, I find the idea of depending on many pharmaceuticals for my daily living to be revolting. Yet anyone suggesting that you can find non-pharmaceutical outlets for curing even the worst conditions (some even make this claim for terminal cancer) likely hasn’t experienced it for herself. I was gravitated towards yoga and meditation shortly after my symptoms appeared—and yes, these practices are tremendously helpful in alleviating and managing the stress that my health condition causes. I would recommend them to anyone, and had I practiced these before my condition worsened, I likely wouldn’t be here writing about how I’m managing my neuropathic pain. But I still find myself needing Western medicine and its drugs to get by—and trust me when I say I’ve tried getting by without it. There, the throbbing remains like a stubborn, unwanted guest in your bedroom. This is the world of neuropathic pain: even the best treatments only have a chance of efficacy. I remember coming across one study that suggested that even our best pharmaceuticals have around a 30% success rate for even partial relief, and there’s even less evidence for ‘alternative’ treatments like acupuncture and meditation (though this, of course, is due to the MIC’s disinterest in free or low-cost, but potentially effective, treatments). People with chronic pain can be especially susceptible to snake oil salesmen precisely because we’ve already been let down by our other health care providers. Like others, my path down this road of chronic pain has been filled with moments of despair, desperation, loneliness, and incredible confusion. My latest attempts are exemplary of the sort of things that people with confusing and difficult-to-treat ailments do. In addition to the Lyrica (pregabalin) and Klonopin I take every night (which only blunts the pain enough to let me sleep), I’ve been having as many as two acupuncture treatments a week and taking what must seem like an alchemist’s prescription: Valerian, Lion’s Mane Mushroom, Milk Thistle, and other herbs alongside Vitamin D and Omega 3 supplements (all taken inconsistently and depending on the day). 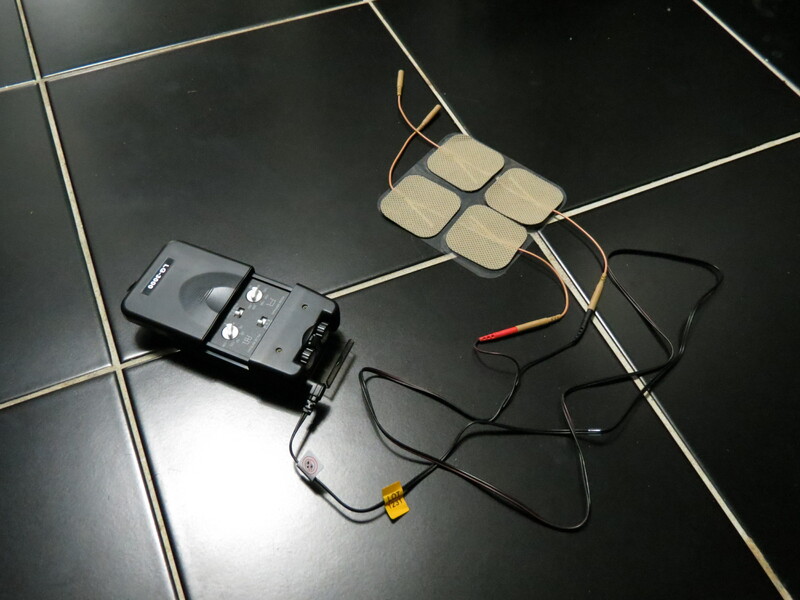 Recently, I bought myself a transcutaneous electrical nerve stimulation (TENS) machine, which works (more or less) by sticking electrodes near the site of pain and transmitting electrical currents. It’s inconclusive science, but the idea is based on what is popularly recognized in neuroscience as the gate control theory of pain (by Melzack & Wall, 1965). Roughly put, the electrical currents from the TENS machine send signals to sensory neurons that then inhibit the activity of pain-signaling nociceptors. I’ve only tried it a few times thus far, but I’ve yet to notice anything substantial. However, I’ve noticed that my particular, subtler pain doesn’t display immediate relief to anything, even the pharmaceuticals—so I’m left wondering if it’s just a matter of time. I’ve kept my heart and mind open to various possibilities (having gone beyond my neuroscientific training in college to reading about homeopathy, Traditional Chinese Medicine, and Ayurvedic medicine), but this was by far the most extreme in challenging the Western allopathic model. I learned about the healer through my acupuncturist, who claimed to have gotten good results from working with him; I decided that, given how stubborn my head-throbbing was (even to consistent acupuncture), it was at least worth a shot. When I went to see the energy healer I was caught a bit off-guard by how small the ‘body scan’ machine was. Perhaps I was expecting something straight out of a science-fiction movie, but the machine seemed too compact to be able to reveal issues in my energy channels. However, as he explained to me over the course of the few hours we had together, the body scan was created by scientists in Germany who worked off the science of meridian points and energy channels (the basis of acupuncture) to create a device that works the way a lie detector machine does—using galvanic skin responses. This portable ‘body scan’ had electrical detectors that were strapped around my index fingers, my forehead, and my left calf—which, the healer explained, would measure my body up against thousands of different potential toxins to find the source of any energy imbalances. Image of the Spectravision Body Scanner the ‘energy healer’ used. I wonder how much one of these is worth. We spent a good deal of time talking about numerology and astrology (for which I admit much ignorance) before the machine finished its scan. What showed up on the electronic screen was a list of toxins and issues correlated with the most imbalance—and much of it surprised me. Inexplicably, ‘gamma rays’ came at the top of the list. Right below it was ‘Headaches’ and some slots below that was “Alkaline Phosphatase” (an enzyme particularly concentrated in the liver). The healer then asked me to hold onto a copper cylinder while he asked me a couple of questions (or gave me a number of prompts) that would measure my body’s sensitivity to the correlating issue. For instance, he would ask me what my name was, and the machine would be able to detect whether or not the response I gave was true. He then asked me a number of times to think about my health concerns and anxieties, and we found that the biggest ‘triggers’ were ‘anxiety’ and ‘worrying.’ Not much of a surprise there. But the body scan also listed ‘cervicogenic pain’ at the top of another list relating to bodily issues, and listed ‘passion’ at the top of a list relating to emotions. It just seemed to hit the nail on the head there as far as accuracy. Was this for real? Was I dreaming this? I still can’t say for sure what I think—or how I feel—but I went along with his prompts as we continued to “solve” the mystery behind my ailments. What was possibly the most surprising component of that session came when we tried to find the health condition that was troubling me. I remember going home that night utterly confused. From the healer’s perspective, what I needed to do (in accordance with my astrological signs) was follow my heart, follow my passions and my instincts, and learn to love myself. That was the prescription. How the hell would I go back home, wanting to manage my chronic pain, with information I already knew? Any number of books I’ve read would have given me the same advice. I know, for instance, that meditating frequently will help me deal with stress more effectively. But meditation is at least a practice I can manage. Following my heart and learning to love myself? That’s a little too amorphous for me to work with. What boggles my mind the most is the fact that I still can’t refute the efficacy of anything I’ve tried. Maybe, just maybe, the healer was right and the ‘cure’ is to ‘follow my heart’ (whatever that means). Maybe, just maybe, the solution is to quit my job and do as much yoga and meditation as possible. Maybe shocking my brain every day will help, and maybe taking more of the pregabalin in conjunction with the other treatments will work. Is this the best I’m going to get? Is there yet another solution lurking in the corners I haven’t tried? Do I keep looking or work on acceptance—or both? Perhaps this is just the way it’s going to be—at least for now.